Fans are used to seeing Mike Cooley trading off vocal duties on stage with Patterson Hood, his longtime band mate and co-founding member of Drive By Truckers. Anyone lucky enough to catch their last Chicago show (November 2015) at Thalia Hall saw why DBT, plugged-in and rowdy, is one of the great American bands of the last twenty years. Tuesday night’s show at Chicago’s City Winery was equally impressive but featured one man only: Mike Cooley and his custom acoustic Baxendale. Cooley-Heads were on their best behavior in the reserved setting—until six songs deep when audience members recognized the opening chords to “Marry Me” from 2003’s Decoration Day. A little hootin’ and hollerin’ crept in over the remainder of the night as Cooley presented gem after gem from a twenty year, ten studio album career. 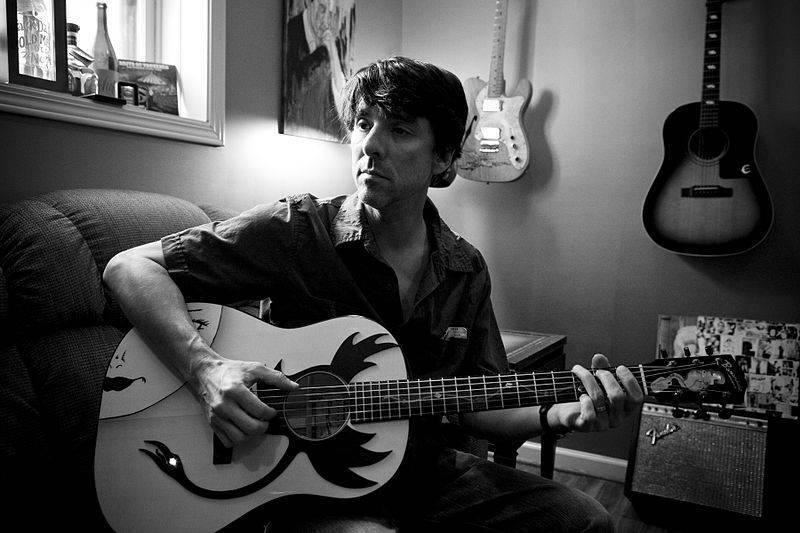 Cooley’s twenty song set covered every DBT album ranging from 1998’s Gangstabilly through 2013’s English Oceans, including “Gravity’s Gone” (2006 Blessing and a Curse); “Cotton Seed” (2004 The Dirty South); “Women without Whiskey”, “72”, and “Zip City” (2001 Southern Rock Opera). Cooley even donned a harmonica for “Birthday Boy” from 2010’s The Big To Do. Rarely does a band compile a volume of work in both depth and breadth—twenty years worth of memorable characters and scenes from albums that often read like stories and vignettes. Mike Cooley’s continued focus on craftsmanship and American Realism is a big reason why. This weekend The Chicago Ambassador’s James Clarke had a chance to catch up with Cooley in advance of the City Winery Shows. CA) Welcome back to Chicago. You’ll be performing two nights this week at City Winery. What is it that has drawn you back to the stripped down format of solo shows? Cooley) I always try to play a few solo dates when the band is off for a while. While I don’t necessarily want to be out touring, I still feel the need to play in front of an audience and the challenge of going onstage by myself is an opportunity to grow in ways that carry over to the DBT shows. CA) You released your only solo record, The Fool on Every Corner,in late 2012. The next Drive By Truckers album, English Oceans, was released in early 2014 and was strongly represented by your songs. To what do you attribute the greater representation? Cooley) Before recording what would become English Oceans, we took more time off than probably ever before and that as much as anything, allowed me to get my mind where it needed to be to write songs. A lot of those ideas had been in my head for a long time, and I was finally able to see them through. CA) Would you speak to the benefits or challenges of co-fronting/co-writing with a songwriter as prolific as Patterson Hood? Cooley) Co-fronting and writing is actually the perfect situation for me, and the fact that Patterson is so prolific is part of what makes it work. Our styles happen to be compatible and I can contribute as much or as little as I want without feeling pressured to constantly come up with material. CA) Prior to co-founding DBT, you and Patterson performed as a duo called Virgil Kane. Virgil Caine is the narrator of the Band’s “The Night They Drove Old Dixie Down.” Would you say at the time you identified with that narrator? Cooley) I was in my mid twenties during the Virgil Kane era and feeling lost and looking for a direction to go. I guess that’s somewhat normal at that age. I don’t think I identified as much with the words of the speaker in “The Night they Drove Old Dixie Down” as I did the longing in Levon Helm’s voice as he sang it. It sounded like I felt most of the time. CA) On the most recent DBT live album, It’s Good to Be Alive, you introduce “Made Up English Oceans” with the beginning of an anecdote about Jimmy Carter and the KKK showing up to your hometown in 1980. You end the introduction with the phrase “a lot changed and a lot didn’t”. Would you elaborate? Cooley) In the 1980 Presidential election both the Carter and Reagan campaigns kicked off in small southern towns. I guess they both felt like it would be won or lost in the south. Jimmy Carter came to my hometown of Tuscumbia, Alabama, birthplace of Helen Keller, and Ronald Reagan to Philadelphia, Mississippi, where three civil rights workers were murdered in the mid 1960s for registering black people to vote. Race, and how people felt about it, played a role in that election and it was used in some pretty shameless and irresponsible ways. Things changed enough to elect a black president, but not enough to keep feelings about race from being used shamelessly to score cheap political points. CA) Following your upcoming solo dates, can we expect new material from Mike Cooley solo or with DBT any time soon? Cooley) I’m always looking for the next song or idea that can grow into something meaningful, and a solo release of original material is something I’d like very much, but in the meantime DBT is scheduled to release a new album in September we’re very excited about. Drive By Truckers eleventh studio album “American Band” is due out on September 30th, 2016.